The identity of the evergreen trees in a grove along a small portion of Holly Hedge Road in Jungle Gardens eluded inquisitive visitors for many years. The grove consists of perhaps a dozen trees, several of which are quite tall, although their trunks are not particularly large. 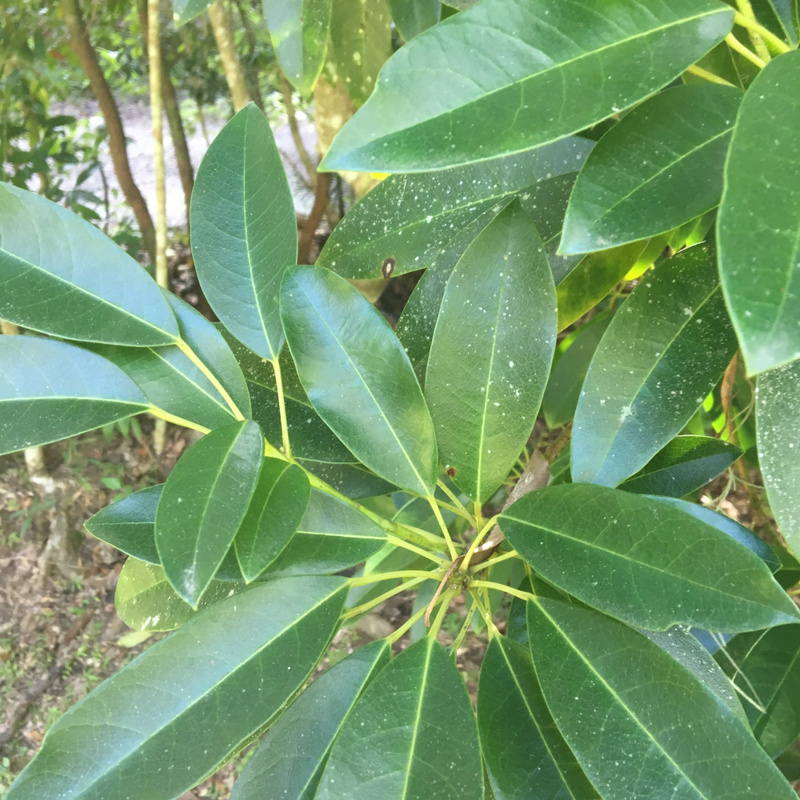 Those who saw the trees thought the stiff, leathery evergreen foliage resembled members of the Laurel family, or perhaps the Magnolia family or maybe even some relative of Rhododendron. No one, however, knew the true identity of these trees. Most of these trees are hidden behind large hollies and generally not visible while driving the roadway. A couple of trees occur on the banks of both sides of the road, but finding them is not easy because of the large hollies that abound. Additionally, two trees are some distance from the grove. One very young tree, growing in a wooded area near the entrance to Holly Hedge Road, is likely the result of recent seed dispersal. The other, found by Mike Richard, Sr., some years ago, is a tall, mature tree, located on the summit of a forested ravine near the Old Nursery and just below the Sunken Gardens. This single large tree could be the last survivor of a possible former planting or another seed-dispersed plant from the main grove. In late winter and early spring, the foliage produces a very attractive flush of color. The leaves, which are arranged in a tight whorl or spiral, give the tree a very colorful appearance. The petioles (the supporting stalk of a leaf) of each leaf at the tip of a branch are bright pinkish red. This bright petiole color lasts for several weeks, but eventually, as the leaves mature and age, it fades to green. It appears the color of new leaves may provide the primary ornamental value of the tree. During the spring of 2017, my first full year in Jungle Gardens, I visited these trees regularly in anticipation of finding flowers. 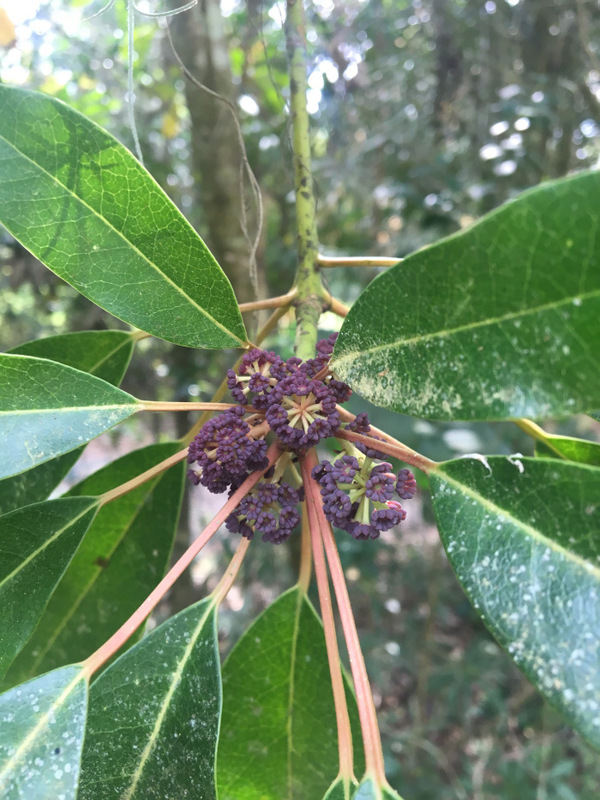 On March 3 when I visited the grove of trees they were flowering. The flowers were most peculiar. Emerging from the axils of the previous year’s growth, they resembled clusters of small berries radiating out from a central axis. The flowers had no petals or sepals, consisting solely of reproductive structures. All those I observed were all pollen producing male flowers. I knew, however, that at least one female tree had to exist because of the abundance of seedlings volunteering below the adult trees. Examining the trees on July 5, 2017, using binoculars, I located a single female tree with clusters of fruit high up in the canopy. 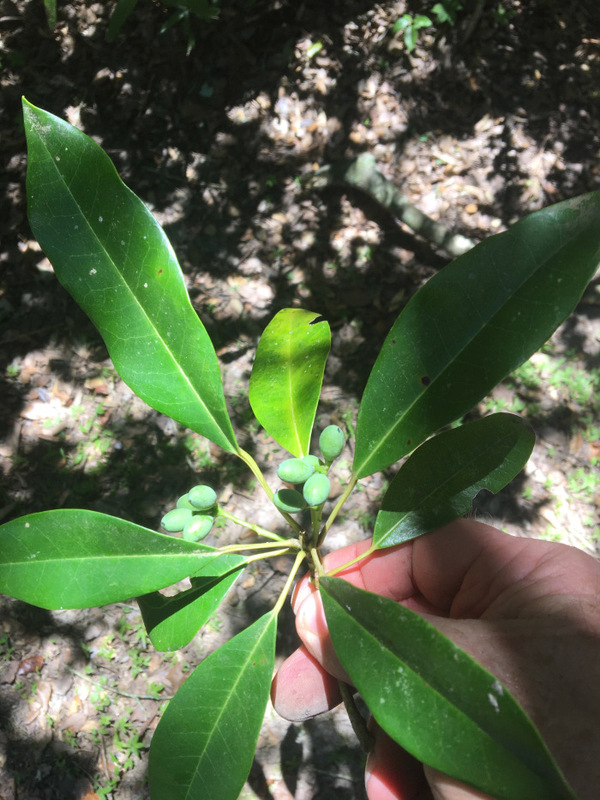 Dylan Derouen scaled the slender tree and collected a fruiting specimen. Because of the unique nature of the flowers, the identification of the trees as Daphniphyllum macropodum was not difficult. Daphniphyllym is a monotypic genus in the Family Daphniphyllaceae. There are about 10 species in the genus consisting of small shrubs and trees found in China, Japan, and Korea. Like all species in the genus, D. macropodum is dioecious, meaning male and female flowers are borne on separate plants. Perhaps the most interesting discovery regarding these trees occurred after their identification. One day in July 2017 I examined some of the many folders in Archives that may or may not contain information pertinent to Jungle Gardens. Much to my delight, in the very first folder I selected and went through I found a letter and attached plant list from the Yokahama Nursery in Yokahama, Japan, dated November 24, 1919. The letter, addressed to E. A. McIlhenny, discussed his purchase of seeds. There was a second page that served as an invoice or statement of purchase. The very last entry on that second page was that of Daphniphyllum macropodum seeds he had purchased. We now had a document in Archives with the plant’s name and the date of acquisition. Ninety-nine years later, this species is still flourishing in Jungle Gardens.